This volume provides a timely assessment on the progress made towards the achievement of a constitutional democracy in South Africa. The chapters collectively present an in-depth analysis of the development of the legal system and of the implications of the Constitution for the social configuration of power. To what extent has the vision of constitutionalism contained in the Constitution been realised? Primarily concerned with the impact of laws and the salience of their existence and enforcement for South Africans, the work highlights the importance of placing the constitutional regime in its historical, cultural, social, economic and political context. 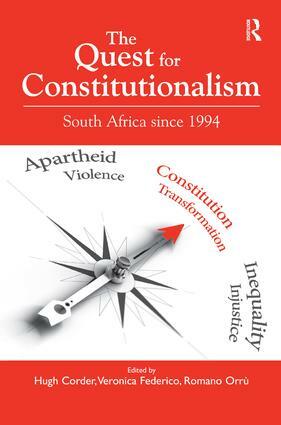 The book further recognises the importance of the South African constitutional provisions for transnational or globalised constitutionalism more broadly. It contains contributions from South African scholars, as well as European authors, bringing in new analytical angles and adding a specific comparative dimension. Through the prism of South Africa, the authors discuss the innovative character of constitutional and legal provisions in terms of both constitution-making and law-making processes and their contents. This book provides analysis that will be relevant to scholars, students and practitioners, specifically those interested in International Relations, Law, Sociology of Law, and African Studies, as well as socio-political comparative studies. Hugh Corder is Professor of Public Law at the University of Cape Town, South Africa. A graduate of the universities of Cape Town, Cambridge and Oxford, his main teaching and research interests fall within the field of Constitutional and Administrative Law, particularly judicial appointment and accountability and mechanisms to further administrative accountability. He has published extensively in these and related areas. Professor Corder has been widely involved in community work since his student days, concentrating on popular legal education, race relations, human rights and the abolition of the death penalty. He served as a technical adviser in the drafting of the transitional Bill of Rights for South Africa. Dr Veronica Federico is Senior Research Fellow in the Department of Public Law, University of Florence, Italy, where she taught Comparative Public Law. She is also a Lecturer with the Boston College, in its study-abroad programme in Italy. She is a former research associate of the School of Social Sciences of the University of the Witwatersrand, South Africa, and has studied and published on constitutionalism and democratic transitions, with a special focus on South Africa, on citizenship, fundamental rights, social enterprise and third sector. Romano OrrÃ¹ is Full Professor in Comparative Constitutional Law at the University of Teramo, Italy. He also teaches Public Law in the Faculty of Economics at Milan’s ’Bocconi’ University. He has held a number of visiting fellowships in Europe, the USA, and South Africa. His research interests include Constitutional Justice, Federalism, and Systems of Government (with special focus on African Countries, Portugal, and Brazil). He is an established author who has published in both Italian and English.